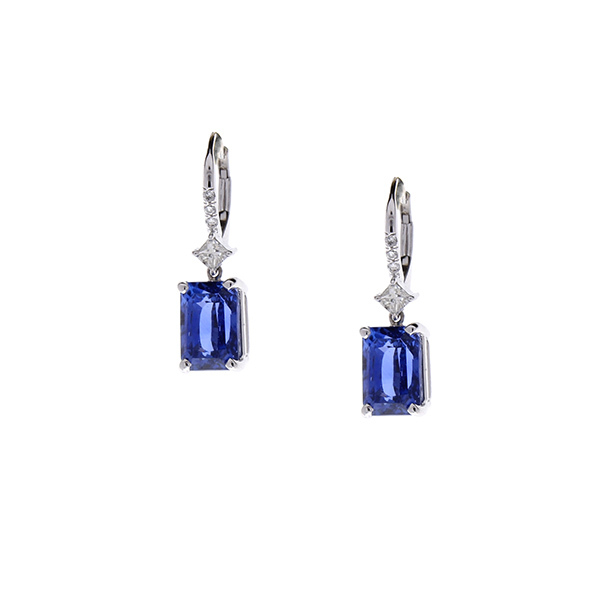 These dangle earrings feature two radiant cut blue sapphires totaling 5.96 carats and measuring 8.7x6mm. The gem source is Sri Lanka; the color is vivid royal blue; perfectly matched in size, color, transparency and luster. 2 matched Princess cut diamonds act as the connection between the round brilliant cut diamonds and the sapphires totaling 0.26 carats with G color and VS clarity. Created in brightly polished 14 K white gold, these precious gems are held on by gem-set lever backs.